One lucky Overland Expo fan will get to take home the ultimate adventure set-up from Turtleback Trailers & 23Zero Roof Top Tents! Keep your eyes peeled for more info soon on how to sign up for this awesome giveaway in honor of Overland Expo’s10th Anniversary! The Turtleback Getaway Trailer features a massive 50+ cubic feet of storage with a rear access door as well as a gas-strut-assisted lift lid. The 800-lb. trailer rides on Timbren 2000HD axle-less suspension and accommodates both 5- or 6-lug hubs. The trailer also features dual front corner recovery points, 2000-lb. swing away tongue jack with foot, safety chains, a seven-way round trailer plug, and a roof rack with four cross bars. The 23Zero Bondi 3-Person Tent is equipped standard with a comfortable Queen Size 3 inch thick mattress with a built-in waterproof base. The tent fabric is 260-gsm ripstop poly-cotton canvas (waterproof and mold-resistant) stitched together with French seams and tape seam sealed to keep you dry in all conditions. The Bondi sits on an alloy base with cast alloy frame lugs and a stainless steel hinge. There are four unique windows that open from inside the tent, allowing awesome views without sitting up as well as a sturdy 82-inch square sliding alloy ladder. The 23Zero Bondi folds on top of itself with ease and sits under a rugged 600-gsm PVC transit cover with four X-D ring tie downs. New this year, Overland Expo attendees can ride and drive in General Tire demo rigs outfitted with the latest off-road equipment on a custom-designed driving course. Stop by the General Tire display to choose the light truck/suv tire that is right for you. The test drive will feature General Tire’s off-road capable Grabbers and more. Grabber X3 - Bold and aggressive mud-terrain tire that delivers extreme off-road performance in mud, dirt and rocky terrain, with 3-ply durability balanced with impressive on-road performance. Grabber A/T X - The aggressive all-terrain tire that provides exceptional off-road capability and durability, balanced with impressive on-road performance. Three-Peak Mountain Snowflake and studdability deliver confident driving in all weather conditions. Attending any socials or happy hour events at Overland Expo West? Stop in to taste your way thru a line up of tasty Flagstaff brews from Mother Road Brewing including local favorites, “Tower,” “Daily” and “Sunday Drive.” Plus, enjoy several custom beers they’ll be brewing special for Overland Expo attendees. Flavor: Hop forward with lots of citrus and tropical fruit flavor balanced by a lightly bitter finish. OVERLAND EXPO WEST TURNS 10! Can you believe it? It’s been 10 years since our first Overland Expo event at Yavapai Fairgrounds in Prescott, AZ! We invite you to join us to celebrate the occasion at Overland Expo WEST, May 17-19 in Flagstaff, AZ. We’ll be rolling out commemorative t-shirts, giveaways, and more via Overland News in the coming weeks so stay tuned! BUY NOW. Don’t be the only fan at Overland Expo West without this limited edition, 10th Anniversary t-shirt! Pre-order your commemorative event t-shirt TODAY for just $25 - all orders must be placed by May 10th. 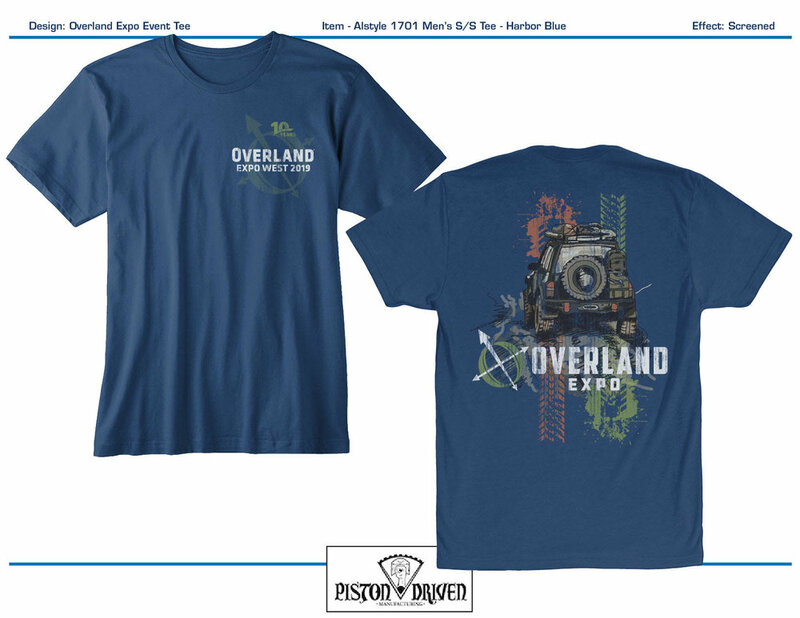 T-shirts can be picked up on-site from the Overland Expo merchandise display. We gave our event logo a new look this year and we hope you like it as much as we do. We have more tricks up our sleeve to celebrate the 10th Anniversary. Check back for more info on event giveaways, presentations on the history of the show, special events and more. Best Shot Contest Winner Announced! Congratulations to 2019 WEST Best Shot Contest winner, Greg Beck! Beck’s shot, “Waiting for the meteor shower,” was taken in the Northern Arizona high desert, about 15 miles from Meteor Crater. FOUR WHEELER Magazine and Overland Expo team-up to launch the Inaugural Four Wheeler Overland Adventure. The epic 3-day journey will be a guided back roads tour of Arizona set to culminate at the 2019 Overland Expo West event in Flagstaff, AZ.